What is the environmental benefit of using solar electricity compared to other sources of electrical power? A typical PG&E residential customer uses 6,480 kilowatt-hours (kWh) per year. Using the land under option, excluding acreage set aside for environmental remediation, the Panoche Valley Solar Farm has the planned capacity to generate enough energy for over 125,000 PG&E residential customers. Typical gas combustion engine cars produce 11,077 lbs CO2 per year. The Panoche Valley Solar Farm will offset the gas combustion engine car's CO2 emissions of over 38,500 PG&E equivalent customers or over 170,000 coal-based electricity customers. Who will buy the power from the solar farm? The Owner of the solar farm project will sell future output to California utilities, municipalities and industrial customers. What are the potential environmental impacts of the solar farm? Unlike the Mojave Desert, where many solar thermal or concentrated solar projects have been announced, the proposed land for the Panoche Valley Solar Farm is privately owned and previously cultivated by farmers. However, due to the lack of access to water, the land has primarily been used for cattle grazing. Compared to grazing cattle, this project will have a similar impact on indigenous plants and animals. The Developer performs environmental surveys to monitor the impact on existing species and plants on the site and mitigate any issues found during the Environmental Impact Report ('EIR') surveys. Photovoltaic solar technology was chosen by the Developer to minimize the impact on the land. Our strategy is to install solar panels within the natural contours of the land eliminating the need for scraping, paving or placing gravel on the site. Posts are set directly into the ground without the need for cement. We also plan to raise the panels in order to continue to allow grazing of sheep, which will help maintain the grass height as well as the current habitat on the property. Unlike thermal or concentrated solar, thin-film solar has no moving parts, do not emit light or use mirrors or water to generate electricity. There will be no air emissions from electrical generation and little or no vehicle traffic once the project construction is complete. Wind erosion of soils will be controlled to minimize dust during construction and operation. The low physical profile of the facility will minimize disruption of the vistas. The facility will generate minimal noise during operations, and will emit negligible light during nighttime hours. Cultural resource surveys have and will be conducted to analyze any potential impacts to resources. Any environmental issues will be analyzed and mitigated through collaborative work with environmental groups and government agencies. How will this solar energy project help our local economy? The people employed by this project will generate more customers for local businesses. In addition, up to 450 more indirect jobs from the solar farm project in San Benito County will help stimulate economic recovery when the county needs it most. How else will this solar energy project benefit our community? Solar projects are exempt from paying property taxes, but we feel this is unfair to County government and the people who live here. That is why we will make voluntary payments to the County up to millions per year. This money can help pay for things like water conservation, air quality improvements, energy efficiency, parks maintenance, public safety and other County services. 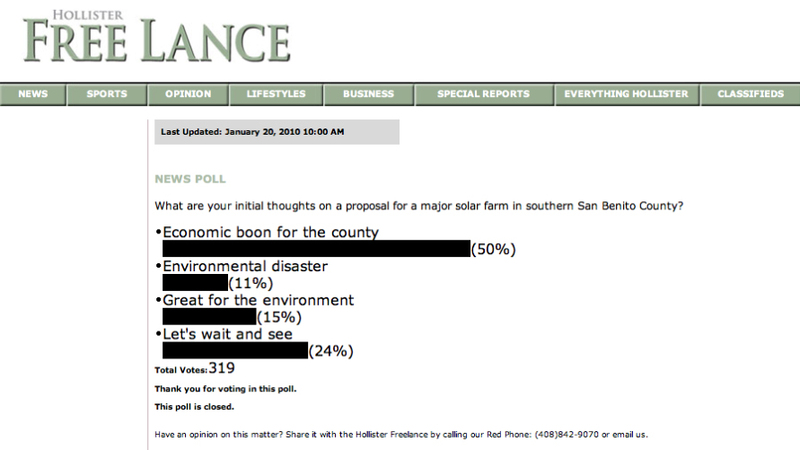 How much water will this solar energy project take from San Benito County homes and farms? Water use will be limited to keeping dust levels down during construction and periodic rinsing of the solar panels after installation. The water will come from onsite wells, which ensures no additional water is diverted from agriculture or community sources. Will this solar energy project be harmful to the environment? We will invest millions to reduce environmental disruption and protect wildlife near the project by raising solar panels off the ground, using special fencing that allows animals to access the property and by using fewer panels in environmentally sensitive areas. We also secured additional land nearby for long‐term environmental protection. Will the project contribute to air pollution in the valley? Unlike traditional power plants that burn coal or oil and pollute the air, solar electricity is derived from the sun, which means less pollution and cleaner air for all of us. This project will provide a clean, safe and reliable energy supply, helping reduce dependence on foreign oil. Will new transmission lines be required for this solar energy project? No. The project will be located in close proximity to existing transmission lines. Not having to build new transmission lines will further protect scenic vistas, plants and wildlife in the area. What do we do to mitigate environmental effects? We plan to set aside thousands of acres of nearby land to mitigate for the impact the project may have on protected native species. In laying out the project, approximately 40% of the land will be installed with solar panels and we will avoid burrows, creek wash areas or areas inhabited by protected species. We have and will continue to perform environmental studies to guide them in being environmentally sensitive. What occurs during the environmental review process? San Benito County will study the project through an environmental impact review to ensure compliance with the California Environmental Quality Act (CEQA). CEQA requires the counties to assess the project's effect on air quality, biology, cultural resources and traffic, among other things. A variety of local, state, and federal agencies will consider the project's impact. Among the agencies commenting through the CEQA process are the U.S. Fish and Wildlife Service, the California Department of Fish and Game, and the Monterey Bay Unified Air Pollution Control District. What other permits are required for the project? In addition to the conditional use permits from the counties, the project will require county building permits and permits for access to county and state roadways. The project will also obtain storm water approval and water quality certifications from the California Regional Water Quality Control Board. How much water will the project use? Unlike other forms of power generation such as Solar Thermal and Hydroelectric, harnessing energy from the sun using photovoltaic panels requires minimal amounts of water. We utilize wells on the site to provide water for fire protection and basic maintenance of the site. Water will be used during occasional washing of solar panels and dust control. Total water consumption is expected to be only a few acre-feet per year. Will the project require any new transmission lines? The Panoche Project developer has applied for nearby transmission interconnection to PGE's existing transmission facilities. The interconnection point and the transmission path will ultimately be determined through a study by the California Independent System Operator (CAISO) and the environmental permitting process. The project will be interconnected by construction of a 230 kilovolt substation on the property. The Project will utilize existing power lines with no new construction or new Right Of Way (ROW) access required. Will the project be compatible with local aviation? The Panoche Valley Solar Farm will be compatible with local aviation interests. The low physical profile of the facility will not interfere with flight paths. The dark-colored solar panels are designed to absorb light. 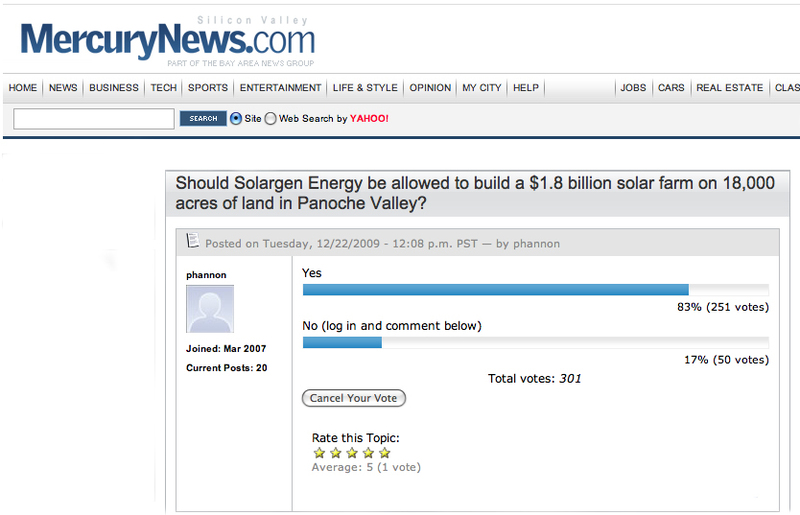 How was the Panoche Valley solar farm site selected? After conducting a thorough investigation of potential locations in Central California, we selected the Panoche Valley for its favorable characteristics. The site is large, has excellent solar characteristics, flat terrain and compatible land use zoning to solar farms. The acreage was previously used for farming and grazing. There is a significant block of contiguous land and power lines crossing the property. Pacific Gas & Electric high-power transmission lines cross the property offering a natural connection to the power grid. Compared to the floor of the San Joaquin Valley, which can be blanketed in the winter morning fog, the Panoche Valley site has more days of sunshine. The solar potential of the site is approximately 90% of what is found in the scorching Mojave Desert. The site location has one of California's best solar radiation resources. How many jobs will the solar energy project create? During construction of the solar farm, at least 150 direct jobs and up to 450 additional indirect jobs will be created. Long-term operation of the Panoche Valley solar farm will require up to approximately 50 full-time skilled technicians, administrative, maintenance, and security staff. The Project Develper will seek local workers to fill job vacancies for both construction and operations. To be considered in any bidding processes, please submit information to info@nevoenergy.com. How much land will the project use? The Panoche Valley Solar Farm has been designed to occupy 4,717 acres within the Panoche Valley. The footprint would occupy less than one third of the Panoche Valley and is located strictly on dry cattle grazing land. Does the Project have plans to convert to a Public Utility or utilizing Eminent Domain? No. The Developer currently plans on Developing, Constructing and Operating the Panoche Valley Solar Farm as an Independent Power Producer (IPP). Eminent domain refers to the power possessed by the state over all property within the state, specifically its power to appropriate property for public use of roads and schools. States have granted public utility companies eminent domain powers to run telephone, power, water, or gas lines. The Developer is a privately owned enterprise that cannot exercise eminent domain. The Developer will purchase all the land in its project. Through the interconnection process, Pacific Gas and Electric could purchase back from the Owner of the Project a small portion of the interconnection facility on the Panoche Valley Solar Farm. PG&E is not building any portion of the solar farm, but reserves the right to buyback from the Project Owner a portion of the upgrades through the interconnection procedure. Will the solar farm be able to withstand an earthquake or tornado? The Panoche Valley Solar Farm, like all other building within the State of California, will comply with the necessary seismic and wind regulations for structural buildings. What other solar power projects are proposed in or near San Joaquin Valley? San Joaquin Solar 1 and 2, a 106-megawatt plant proposed six miles east of Coalinga, would use solar-thermal technology - using mirrors to focus the sun's heat on pipes, heating water to steam that would spin generating turbines. At night, a biomass plant would burn agricultural wastes to keep the turbines spinning. Carrizo Energy Solar Farm on the Carrizo Plain of eastern San Luis Obispo County, another solar-thermal plant with a proposed generating capacity of 177 megawatts. Topaz Solar Farm, also proposed on the Carrizo Plain, using photovoltaic cells to generate 550 megawatts. High Plains Ranch II, yet another Carrizo Plain proposal, which would have photovoltaic cells mounted on supports that would track the sun to produce 210 megawatts. Solaren, Inc. (a different company than Solargen Energy Inc.) proposes using satellites in space to collect sunlight and beam 200 megawatts of power to earth as radio frequencies to a site in western Fresno County. Cleantech America, is developing a 5 megawatt photovoltaic facility in Mendota California. What is the toxicity of the solar panel materials planned to be installed on the project? The Panoche Valley Solar Farm has been designed with amorphous silicon photovoltaic panels due to their long-term reliability and benign environmental impact over the life of the project. The amorphous silicon panels contain no EPA-regulated toxic materials and are not toxic. These panels are primarily made of glass and other commonly found household elements and are recyclable through standard recovery processes. What will the Developer be involvement once the project is completed? The Developer plans to own and operate the facility once it is built. It is planned that the Developer will have office space in San Benito County to facilitate the management of the project and operations of the completed solar farm. What public polling data do you have? Response to article titled "World's largest solar project prompts environmental debate" asking for opinions on Solargen Energy Panoche Valley solar farm project.